a startlingly fresh look at a new medium"
a "rich and beautiful text"
What is the Web for? And why do we care so much? Why has this simple technology sent a lightning bolt through our culture? It goes far beyond the Web's over-hyped economic impact: 500 million of us aren't there because we want a better "shopping experience." The Web, a world of pure connection, free of the arbitrary constraints of matter, distance and time, is showing us who we are - and is undoing some of our deepest misunderstandings about what it means to be human in the real world. "This is a book to savor. Not to speed read. I am not a techie - but I ardently believe the Web will change everything. David has made me laugh ... and frown ... and pause and think ... and scribble furiously in the margins ... and call friends a continent away for long conversations. That's exactly the right mood for exploring the consequences of the most profound medium of social and political and economic change in hundreds of years." "Someday, someone was going to notice that the Internet is not just virtual, but instead connects to, and fundamentally affects, society. In this rich and beautiful text, Weinberger weaves an account of the places in our social and conceptual fabric where the Internet will pull, and possibly tear. This is not a book about the Internet and society; it is about society, marked with the net. " "In the tradition of Marshall McLuhan, David Weinberger has offered a startlingly fresh look at a new medium. At its heart, Small Pieces is an elegant and ultimately hopeful inquiry into the human condition itself. Once you read this book, you'll see the web - and yourself - in a whole new light." "David Weinberger is a rare discovery - an information guru who makes his complex message clear, allowing the access and understanding that are enhanced by storytelling and humor. 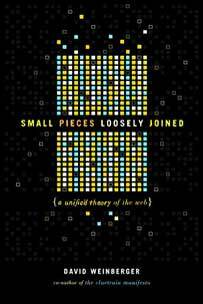 Small Pieces is a big book, even better than his wonderful Cluetrain Manifesto." "Small Pieces provides the best of all combinations: deep, thoughtful commentary written as light, easy reading." "We haven't begun to understand how the connected world will shape our lives at a level deeper than commerce and conversation. Weinberger takes on the harder, deeper questions of values, social norms, and individual behavior that will be the Internet's real legacy." The Web doesn't exist in space, yet we talk about going to sites, entering them and leaving. Diaries move on line and suddenly they're more about creating selves than writing about them. Web sites don't have fences, yet a site for auction hunters was found to have trespassed on eBay, a metaphorical offense for which it paid a very real price. Companies invest heavily in professional, polished Web sites, but the Web rewards sites that revel in imperfection. Bits are the "atoms" of the Web, but they have no weight, no size and no real existence. These anomalies are just a few that show how uncomfortable the fit between the Web and the real world is - and how deeply weird the ordinary life of the Web is. In this one-of-a-kind book of social commentary, David Weinberger takes us beyond the hype, revealing what is truly revolutionary about this new medium. Just as Marshall McLuhan forever altered our view of broadcast media, Weinberger shows that the Web is transforming not only transforming social institutions but also bedrock concepts of our world such as space, time, self, knowledge - even reality itself. The Web would be important enough if it hooked up our species on a global scale. But, Weinberger argues, it is doing much more than that. Unlike previous technologies, such as the phone or fax, the Web is a permanent public space that gathers value every time someone posts a Web page, or responds on a discussion board, or replies to a mail list. The result is that the Web is a second world, layered on top of the real world, that's drawing into it more and more of our social life lives together. Weinberger introduces us to the denizens of this second world, people like .Zannah, whose online diary turns self-revelation into play; Tim Bray, whose map of the Web reveals what's at the heart of the new Web space; and Danny Yee and Claudiu Popa, part of the new breed of Web experts we trust despite their lack of obvious qualifications. Through these stories of life on the Web, an insightful take on some familiar-and some unfamiliar-Web sites, and a pervasive sense of humor, Weinberger is the first to put the Web into the social and intellectual context we need to begin assessing its true impact on our lives. The irony, according to Weinberger, is that this seemingly weird new technology is more in tune with our authentic selves than is the modern world. Because the Web foils our conventional assumptions about concepts like space and time and self, we are led back to a more authentic view of what it means to be a person sharing a world with others-whether it's the world of the Web or the real world of atoms. Our experience on the Web enables us to recapture the truth of our experience of the real world. Funny, provocative, and ultimately hopeful, Small Pieces Loosely Joined makes us look at the Web - and at life - in an all new light. David Weinberger is the publisher of JOHO (Journal of the Hyperlinked Organization). He is a commentator on National Public Radio's All Things Considered and a columnist for Darwin Magazine, KMWorld and Intranet Design Magazine. Co-author of the bestselling The Cluetrain Manifesto, he has written for a wide variety of publications, including Wired, The New York Times, and Smithsonian, and gives talks around the world on what the Web is doing to business. The title and subtitle explained. The Web - more an idea than a technology - is challenging the bedrock concepts of our culture: space, time, matter, knowledge, morality, etc. Why do we perceive the Web as a space when in fact it isn't? The Web will always be a little broken says its creator, Tim Berners-Lee. Just like us mortals. The Web is a new public space, solving the old contradiction between viewing ourselves as faceless members of a mass and as "face-ful" unique individuals. We've thinned knowledge so far that we actually think we work like computers. The Web oddly retrieves a more bodily, less anorexic, sense of knowledge. The very "stuff" of the Web is profoundly social and meaningful. It thus lets us see that our traditional realism is not only wrong but dreadfully alienating. The Web's hyperlinked architecture is connective and based on shared caring. It thus reflects the basic structure of morality. Hope is in order. "...this exceptionally readable and often funny treatise makes strong arguments and ends with a convincing forecast for positive changes in the way we live." "At its heart is a simple insight: That most of what's on the Web is there because someone is interested in it, cares about it passionately enough to put it in front of the rest of the world.... it's a social commons on which the interests of a mass of individuals are splayed in universally accessible detail and trumpeted in an effectively infinite array of personal voices. That concept is almost unfathomable to media pros whose business is "aggregating eyeballs" to sell to advertisers. "...David Weinberger guides us gracefully through the effects and history of that revolution, just in time to ready us for the next one. 'The Web will have its deepest effect as an idea,' not as the tool it has become for most of us, Weinberger concludes." "He begins gently with suppositions..., raising issues, one by one, picking up speed, drawing us further and further from concepts we are comfortable with, until, midway through 'Small Pieces,' we look down to find our understanding of the Internet - as a tool - far beneath our feet. It can actually make you dizzy...."
An "enjoyable read" ... "Weinberger isnt quite serious about his subtitle ["A Unified Theory of the Web"]. Rather, he provides a thoughtful explication of the phenomena that any such theory should unify: from the design of e-commerce sites to why the phrase All your base are belong to us swept the Web. Of the three authors [reviewed here] hes the most overtly philosophical, with chapter titles like Space and Time. And he makes an interesting point: the idea of the Web is in some ways more important than the mechanism of the Web. The truly transforming impact of the Internet will occur when the linking and virtual existence that we experience on the Web starts to alter how we understand and manage society itself. "Weinberger explores the subtle ways that this new connectedness affects all aspects of business and life. The discussion is calm, even rational, but his excitement is palpable without being hyperbolic. It's a freewheeling sort of meditation on the reinvention of communication and transaction that the Web has enabled." "Given the hype surrounding the Internet over the past decade, Weinberger's thoughtful analysis presents an interesting contrast; it's a bracing and surprisingly comforting view...His quiet passion, thoughtfulness and intellectual curiosity makes Small Pieces a worthwhile meditation. "You've surfed the Web. You've shopped the Web. You may even have traded messages over the Web or created your own Web pages. But have you stopped to think about the Web? I mean really think about the how and the what and the why of it? David Weinberger has, and he presents a raft of thought-provoking conclusions in 200 readable pages titled "Small Pieces Loosely Joined." "He draws not just on a technical understanding of the Web but on a broad familiarity with Western thought. ...[T]he book ... achieves its goal of providing a thoughtful new perspective on the Web and its impact." "It's the best thing ever written about the Web." "...provocative, keenly insightful, funny (sometimes side-splittingly so), well crafted and convincing." "Weinberger beleives the web has, if anything, been under-hyped, so great is its potential to overturn our notions of time, space and even community. ... [A] charming vision of an electronic Utopia. It reminds us that, despite all the wasted money and failed ventures, the web was a wonderful invention. If only we had more time to explore the new world." "...David Weinberger's smart new book..."
"A philosophy professor turned marketing guy turned writer, Weinberger boasts an extremely likeable mainstream intellectual persona, flashes of insight and genuine literary talent. But the aspect of his personality that drives this book ... is his tendency to question." "Weinberger leads readers through an exploration of the Web's implications beyond Amazon.com. ... [His] concepts are, in a way, accurate. Weinberger ... celebrates the Internet's gift to its users: permission to be an individual in a virtual world we can tailor to our passionate, idea-driven taste." ".Weinberger is being compared to MArshall McLuhan for his lucid, groundbreaking analysis of the new medium..a witty, intelligent guide..."
"The next time someone tells you that the Internet revolution failed - as evidenced by all those dotcom busts - hand them a copy of Small Pieces Loosely Joined." "I've got to tell you that this guy can write - very well and very convincingly...The author has a great sense of humor." "If you put a million monkeys without diapers in a room filled with word processors, surely it wouldn't belong [sic] before they produced a book better than this one."